Went to The Cannery in Newport Beach recently, and actually enjoyed some good raw fishies there! Back in the day (i.e. some 15-20 years ago), The Cannery wasn't known for great food; the restaurant in a former fish cannery building served up standard seafood in a cool, historic harbor location and was better known as a great nightlife spot, with an upstairs bar where sun-kissed young folk went to dance to a live band that played fun, Top-40s music. But in recent years, new ownership has changed The Cannery into a lovely dining spot with excellent seafood and wine list, and the upstairs bar has become a sushi bar and lounge. Of course, I was skeptical of the sushi bar part. Knowing its location and its history, I figured the restaurant was serving up overpriced, average-quality raw fish for a wealthy, non-discriminating crowd. So I hadn't patronized "The Can" for a long time, still having the "average quality" idea stuck in my head. Once again, I shouldn't have assumed. I met some friends there for dinner recently in the downstairs dining room. The menu was nicely diverse (Pistachio Baked Brie Salad; aged, bone-in ribeye; an Angus beef cheesburger), without trying to do too much, and offered some out-of-the-ordinary fresh fish choices (including Pike Place Fish Market Wild Salmon, flown in daily) and options for its preparation. There was also some raw fish offered as appetizers: oysters and sashimi from the sushi bar. The prices, as expected, were on the high side. But the quality was also high enough that I felt I got my money's worth. 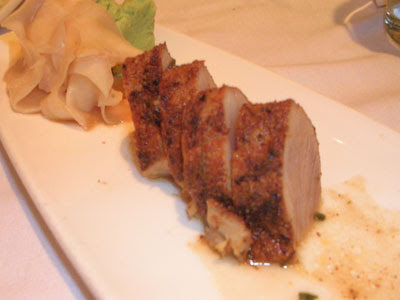 The Blackened Spice Albacore Tataki (pictured above) was a big portion for $12, with 7-8 meaty slices that had a just-right amount of spice that didn't overwhelm the natural fish flavor. The papaya relish and yuzu dressing was refreshing, too. 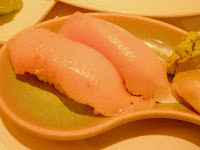 The yellowtail nigiri, for $5.75 an order, was definitely overpriced, but the cuts of fish were superb, buttery and flavorful, and served as nigiri should, with a generous piece of fish blanketing the rice, rather than topping it. My friend Courtney ordered a roll - but this Ultimate Albacore roll ($14) was one I could endorse 100%, chock full of good fish, as you can see, both inside and outside. Delicious, refreshing and worth the price. The upstairs sushi bar and lounge, by the way, is really pretty, with some cool, jellyfish-shaped colored-glass hanging lamps, a firepit and comfy couches and chairs that encourage lingering over drinks and good conversation. Definitely a sophisticated makeover from the former beer hall-esque dance floor that used to occupy the upstairs. The Cannery isn't a destination sushi place for me, but it's a nice place to keep in mind for meeting up with friends with diverse food tastes. Everyone from the Rawfishionado to non-seafood eaters will find something to satisfy them.